Many Bourbon makers can trace their heritage to when Daniel Boone led the first party of settlers over the Appalachians into the Ohio River Valley. "In those days," says Bill Samuels of Markers Mark, a history buff who revels in the telling of Bourbon lore, "distilling was an adjunct to farming. Whiskey was a heck of lot easier to transport to market than corn, wheat, or rye. Every farmer had a still, and a barrel of whiskey was a kind of currency that could be traded for goods, livestock, or even land." Straight Kentucky Bourbon takes its name from Bourbon county, Kentucky, the major transshipment site for distilled spirits heading down the Ohio and Mississippi rivers to New Orleans. Barrels shipped from its ports were stamped with the county's name, and Bourbon and whiskey soon became synonymous. Today, 90 percent of all Bourbon is made in Kentucky, most of it in Jefferson, Franklin, Nelson, and Anderson counties. There are strict laws governing just what a Bourbon must be to be labeled as such. For example, at least 51 percent of the grain used in making the whiskey must be corn. Nothing can be added at bottling to enhance flavor, add sweetness or alter color. Though technically Bourbon can be made anywhere, Kentucky is the only state allowed to put its name on the bottle. 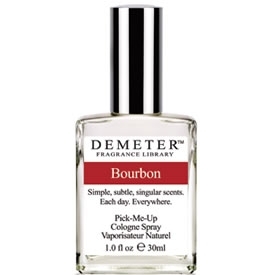 Demeter’s Bourbon cologne is made in Pennsylvania, not Kentucky. This fragrance shows the rich bourbon bouquet of smoky spice and the full sweet flavor of burnt caramel and oaky vanilla.